KoopaTV: Smash Bros. Fighter Ballot: Questions, Answers, and OBJECTION? My Product = Wii U; Help Topics = Legal; My Question = Corporate legal question. "Do you want your favorite video-game character to join the battle in Super Smash Bros. for Nintendo 3DS/Wii U? Well, here's your chance. If you post a video-game character’s name, we’ll consider turning that character into a Smash fighter! Please limit your vote to one per person." There are a few questions people have that need answers to. 1. The official Smash Bros. Facebook said, "Which Nintendo character do you want in Super Smash Bros.?" Will only first-party characters be considered? 2. The directions ask that there is only one vote per person. However, people have reported the ability to vote more than once. Is only the first vote per IP address counted? The last vote? They're all disqualified? How does that work? Use this reference number for follow up: #150404-002749. So they just never answered that for some reason. Not really sure why. As time went on, I lost hope Nintendo would ever answer my question. While it was clarified through other sources that third-party and second-party characters would be considered, answering Question 1, Question 2 remained a mystery. I tried again, August 25, 2015. "The Smash Bros. Fighter Ballot says, "Please limit your vote to one per person." However, people have reported the ability to vote more than once. Is only the first vote per IP address counted? The last vote? They're all disqualified? What exactly happens in this instance? Use this reference number for follow up: #150825-003040. Thanks for writing and for your patience awaiting our response. We've been quite busy lately, which has affected our response times. I can verify that votes for the Super Smash Bros. 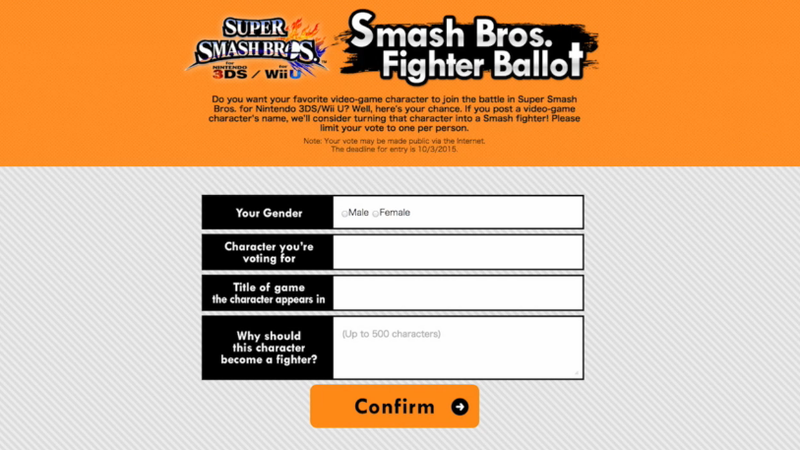 Fighter Ballot are limited to one per person. Regarding your question about how this is enforced/restricted, for a variety of reasons, we do not discuss our internal policies or procedures. Thank you for understanding. I don't think Nayt was saying that bit about patience regarding the time I sent the question in April, which makes it all the more funnier. Well, his answer tells us a few things: Nintendo of America has access to the Smash Ballot policies and procedures, so this is not just a corporate Japan thing. It also confirms there is one vote. We still have no idea about what happens if you vote multiple times. Which vote is the one that is counted? 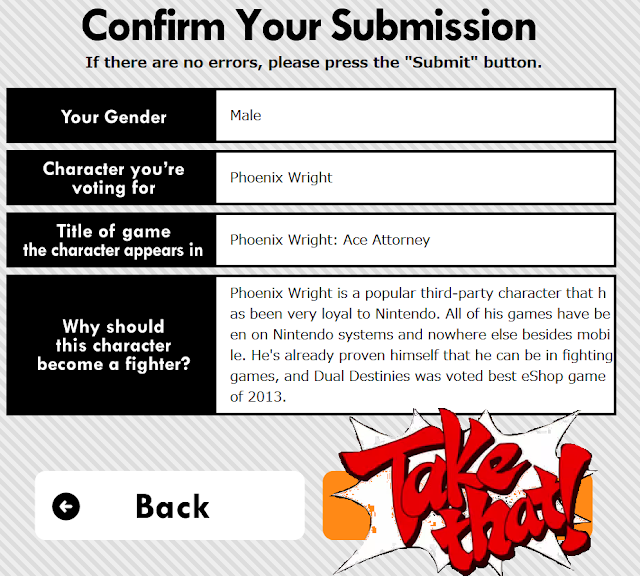 Either way, the time has come for me to submit my vote... For Phoenix Wright! Hey, I just noticed the deadline is set to one year after Super Smash Bros. For Nintendo 3DS's launch date. 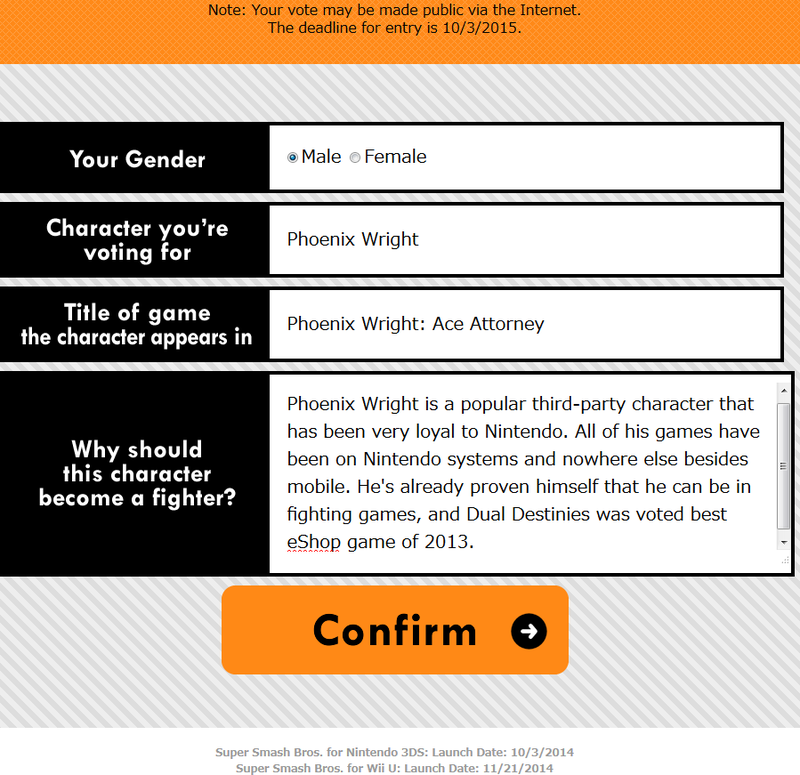 "Phoenix Wright is a popular third-party character that has been very loyal to Nintendo. All of his games have been on Nintendo systems and nowhere else besides mobile. He's already proven himself that he can be in fighting games, and Dual Destinies was voted best eShop game of 2013." Well... I get one vote. Should I do it? ...Confirm! ...And then I got brought to a page that says: "You are not allowed to access this page." Apparently I spent too long. Uh... let's re-input all that info again. ...There we go. I hope this inspires folks to take part of the electoral process. Why did I not put Phoenix Wright on my wishlist back in 2013? I thought only one Capcom character could be in the game, but Ryu proved that wrong. So if there's no limit, then why not three? Phoenix Wright deserves it. And now I'm done with the Smash Bros. 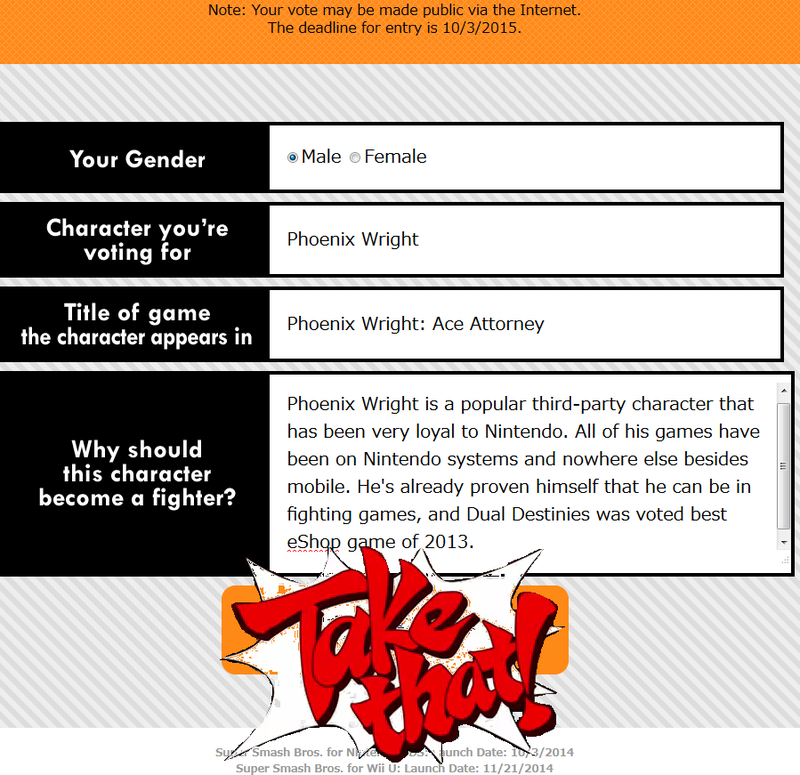 Fighter Ballot — you can only vote once! Ludwig wonders if the Smash Bros. Fighter Ballot results are even being recorded or if it's all just a lead-generation tactic by Nintendo. Either way, Capcom's treatment of the Ace Attorney series makes Ludwig have very low expectations for Phoenix Wright's appearance, but the same could be said for how Mega Man fans felt before E3 2013. So... who did you support? Have you voted? Check out the review Ludwig wrote for Phoenix Wright: Ace Attorney — Dual Destinies here! Rawk thinks that people should vote for Banjo in the ballot, but he's wrong. The winner of the Smash Bros. Fighter Ballot is... Bayonetta. The sequel to the Smash Bros. Fighter Ballot is the Fire Emblem Heroes Battle Ballot. This one allows multiple voting! This ballot was clearly rigged, and it's actually being used fr the game's sequel. Phoenix Wright is going to be in the next game! YES! I originally voted for Lloyd Irving... but since he got a Mii Fighter costume, I doubt he's going to be in the game. I wonder if that means I can vote again for someone else. Well, technically just because you're a Mii Fighter costume doesn't mean you won't be a fighter. ...Or, at least that's the logic that fans cling to. Fans are stupid. Miis were created for the purpose of a "create-your-own-dream-character so we don't have to" feature. Key part is "so we don't have to". 1. IP Address [this is the primary key] — This can be extrapolated into auto-generated fields like country. There are probably other system-captured fields like what browser you were using, along with time of submission. When they go tally up the results, the first thing they'll do is "Find Duplicates" of the primary key, your IP address. The system will then eliminate entries coming from the same IP address but will likely keep one, which might be the first one but it doesn't have to be. It depends how they order the time of submission (descending or ascending). Then they will do a query as to the rankings of "Character" and how many times each character was put in. Then you hope that all the fans spelled the character's name right and with the same variation. And then you can get a huge chart of 'em. I voted for Andy and Sami on different computers. Because Advance Wars deserves to be revived and I want to have an Advance Wars main. Different computers in different places, right? At work and at school and at some other places. 2. At least in school chances are someone voted already. By the way, thanks for your comments! It's a small branch in college so pretty sure only I am a gamer there so I am safe. Also you're welcome. I am usually shy about commenting. One gamer in a whole college branch? That's sucky. Normally (not August 31 specifically, though because the round just ended August 30), your comments would help you enter our KoopaTV Loyalty Rewards Program contest for some Nintendo eShop money. Oh wait, I also voted by my parents and in-laws. Tee hee hee. Wait, you voted for Sami and Andy? Like, in one character slot? Nope, Sami for one of them and Andy for the other. One of the IP addresses, I guess. Divide and conquer doesn't seem helpful here.